A few months ago I had the opportunity to interview Rabbi Jonathan Frankel, an tech startup entrepreneur who was ordained as an Orthodox rabbi at Yeshiva University. I had heard about his wireless intercom invention for the home and was intrigued. 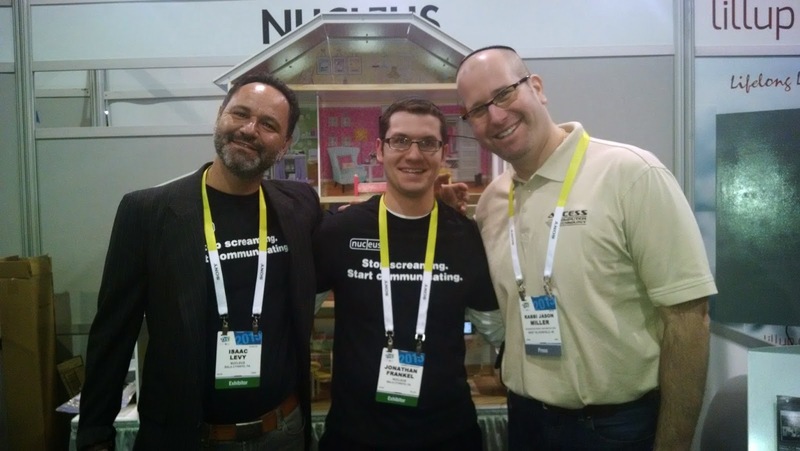 Earlier this week at CES in Las Vegas I had a chance to meet Yonatan in person as he and his business partner Isaac Levy were exhibiting in Eureka Park, the area for technology startups at the Sands Convention Center at CES. Rabbi Jonathan Frankel had no problem getting through rabbinical school at Yeshiva University or law school at Harvard. It was keeping track of his three young sons that had him running around his house losing his mind. The tech-savvy Frankel, 30, would often find himself yelling at the top of his lungs to try and get his kids to come to the dinner table. On the way to his job, he’d be unable to communicate with his wife because he didn’t know where she was – and there was usually a baby crying to add to the commotion. Having grown up in a house with an intercom, Frankel had a feeling that it would be the answer to his family’s communication problem. 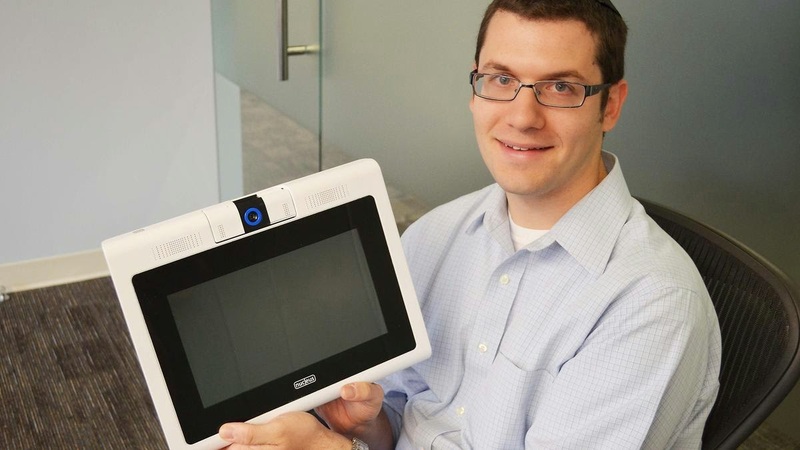 After graduating from law school, Frankel took a job with Boston Consulting Group and it was there that the idea for a 21st century intercom first came to him. He and his wife were moving into a newly renovated home and he began taking bids for intercom installation. He figured that before all of the drywall was installed would be the perfect time to have professionals set up the intercom system throughout the house. This was crazy, he thought. After doing a lot of research for wireless intercoms, he realized that such a technology was not on the market. He had just started at Boston Consulting Group and it was there that he let the idea for a new intercom unit percolate in his head. Traveling a lot for his job, Frankel used his time on airplanes to dream about what such an intercom unit would look like in the age of the internet and iPads. He did six weeks of market research to get a sense of what other types of problems a high tech intercom unit for the home would solve. He knew that with the growth of wireless devices and the popularity of tablet computing, there must be some sort of wireless solution at a much less expensive price. When he realized that a 21st century residential intercom was something that people were searching for – just like he was – but it didn’t exist, Frankel decided that the only way to get his hands on what he was looking for was to create it himself. He quickly launched a fake website to see how popular such a device would be. He bought Google Ads to steer people to his mock website and allowed them to order his wireless intercom (which hadn’t even been created yet). He captured all of their information right up to the point when they would need to provide their credit card information. Without an actual product, Frankel was getting orders. He knew it would sell. The biggest problem Frankel faced was that it had been ten years since he programmed anything. He had no VOIP (voice over internet protocol) or hardware experience. So, he approached a couple of development firms and within months had a working prototype, albeit a rough one. He then found a young man who had just graduated school to come up with the product design. Before he knew it, Frankel had created a wireless intercom that would be revolutionary – and solve the problem he had. Frankel named his new company Nucleus and got to work on getting his product ready for the marketplace. His next step was finding the funding and someone who had experience with software and design. He tapped Isaac Levy, a New York-based software designer and inventor who holds eight patents, to become the company’s chief technology officer. Levy was able to have a beautiful, working prototype ready in about a month. While Levy works on the software technology for Nucleus, Frankel gets the word out about his invention. The WiFi-enabled Nucleus home intercom is already being heralded as one of the top products on the market for 2015 (Frankel is hoping it will be ready to ship by the second quarter of the new year). Each Nucleus device can record video and audio and share the information with the other devices in the home. While Nucleus was intended for parents with young kids (“less running up and down the stairs for parents,” as Frankel points out), the wall mounted tablet-like devices will undoubtedly serve many purposes for different demographics. Nucleus can take advantage of its WiFi connection and high definition (HD) cameras to be extended to other homes. That means kids can collaborate on their homework with their friends via video chat, while a working parent at the office checks in to make sure everyone is safe at home. While promoting Nucleus on NBC’s The Today Show, Frankel video chatted with his grandmother in Toronto showing how Nucleus can be used to keep tabs on elderly relatives as well. Frankel is now traveling the country promoting his novel invention and trying to raise more capital to make Nucleus a reality. He’s eager to find new applications for his product for home security monitoring, real estate tours, and team collaboration in the office place. Nucleus uses voice recognition so it already provides the ideal platform for interacting with the “smart home.” Simply by using your voice within range of any Nucleus, you can instruct it to manipulate your other networked gadgets (“OK Nucleus, turn off the basement lights”). Frankel is interested in eventually integrating Nucleus with other smart home products like NEST (learning thermostat) and Belkin’s WeMo. Furthermore, any Nucleus unit can control how discreet the interaction is with the other units. One unit might only be able to use another unit’s audio, but not video for example. Some units might have to ask permission before accessing audio or video. A nice feature of Nucleus is that they can be used as baby monitors, but then transitioned to a full home intercom system when the children get older. You can preorder as many devices as you want at $150 per Nucleus. Visit the website at www.nucleusintercom.com.